I took the campaign to save Cairn Wood from sale today (Tuesday 19 January 2016) to the Northern Ireland Assembly with the Petition I set-up in early December 2015 calling on the Department for Regional Development Minister Michele McIIveen MLA to remove Cairn Wood from sale gathering over 2,500 signatures, ensuring local voices heard as the campaign to save the much treasured local resource continues. Today my colleague Chris Lyttle submitted the petition directly to the Minister in the Assembly, making it clear local people won’t stand idly by while Cairn Wood is sold and disposed to the highest bidder. I’m grateful to the 2,500 plus people who have signed the petition and the many who have been vocal on the ground since the Minister’s plan became clear in November. Now is the time for action. The Minister has made it clear she expects the sale to be concluded within weeks, but she can’t ignore the voices of a community determined to protect Cairn Wood. With NI Water determined to sell off Cairn Wood to the highest bidder, the Minister must instruct that the site is removed from sale and instead return it to the public to be enjoyed by all. I look forward to the public meeting on Friday and I’ll be pursuing other avenues to keep this valuable asset within public hands. 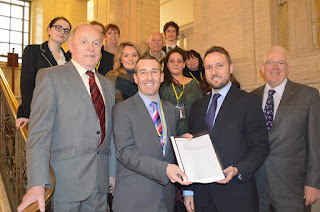 Chris Lyttle MLA added: “I was delighted to formally submit this petition on behalf of everyone in North Down and surrounding area who get much use and enjoyment out of Cairn Wood.